I remember the first time I picked up a Harry Potter book, and how quickly it sucked me into Harry’s world. I recall the late nights I spent reading about The Boy Who Lived and traveling on all of his escapades, how fun and exciting I found it. The text on each page enchanted me, as I vividly envisioned everything — from the pig’s tail sprouting out of Dudley’s backside to Fred and George pummeling Voldemort in the face with snowballs, and—of course—Dumbledore and his wisdom, the lurking danger of Death Eaters, and friendships that last lifetimes. The one word that best describes this experience is magical, because if it were not for J.K. Rowling, I shudder to think how long it would have taken me—if at all—to become the book-obsessed nerd I am today. It was J.K. Rowling who first showed me that incredible window of escape and gently nudged my arm as if to say, “All you need to get lost are the pages of a good book.” I imagine she added a wink, too. Life can be great sometimes, it really can, but how marvelous it is to discover the wonders in a million lives that, if you dared not to read them, would otherwise never experience. The instant I opened the pages to that first Harry Potter book—which, believe it or not, was not Harry Potter & the Sorcerer’s Stone—marked the beginnings of a new relationship. Unbeknownst to ten-year-old me, the Harry Potter franchise would consume the next ten to eleven years of my life. Everything from my pre-awkward pre-teen years through my high school experience, Harry Potter remained a significant part of my world. Harry Potter was my childhood, and I couldn’t have felt more crushed when I realized the adventure was finally over. “This is the end. This story is kaput. Goodbye,” it said. My theatrical self equated this as “what was one a perfect marriage just erupted into a one-sided divorce.” Mentally I shouted at Rowling, and at Harry. “I picked you up. I chose you, and now you are dumping me?” Life was never going to be the same, I could tell. To this day, I still obsess over Rowling’s creation, for the Harry Potter universe populated my childhood with enough fond memories to last a hundred lifetimes. Harry and I were the same age when the first film was released, and from thereon it was like growing up with a best friend. The hours I spent daydreaming that somewhere on this planet was a gateway into a magical realm seems endless. How many of us have sat back after reading a Harry Potter book and inserted ourselves into Harry’s world? I have walked the grounds of Hogwarts, drank tea with Hagrid, jinxed Crabbe and Goyle (I like Draco too much to cause him any harm), and chased Ron around with a love potion. I’ll be one of the first to admit to how occupied I can become with these books, and if you tell me you’ve done no such a thing, you’re a filthy liar. After all I have said, however, comes the part where I drop a bomb and everything erupts into chaos. I have a secret to tell you. It’s not a dark secret full of juicy detail you can spend hours gossiping about, however. All the same, I feel downright ashamed, because—and here it is—I don’t like the Harry Potter & the Sorcerer’s Stone! Okay, no, that came out wrong. I like year one, I do, but not nearly as much as I wish I did. Why is that? To start, I admit to harboring a greater love for the film adaption. It is my honest, desperate wish that Chris Columbus had directed all eight Harry Potter films. I feel that Columbus’ movies stayed the truest to the books out of all the films in the series. His adaptions catch a beautiful sense of excitement and adventure that feels just as magical as they are cinematically engaging. I can speak every character line before the characters say the lines themselves. Like a memorized play, I have committed the movie to heart from beginning to end. But can I say the same is true for this book? I can’t, as much as I hate to admit it. In a way, the film does for what the book doesn’t: it breathes life into the story, and in vivid, sparkling detail. This doesn’t mean I find the book dull in comparison, but there are contributing factors that feed my dissatisfaction. As I said, Harry Potter & the Sorcerer’s Stone is not the first book I read. In fact, it was closer to one of the last books I covered in the series, and you can bet I watched the movie before exploring year one in text. 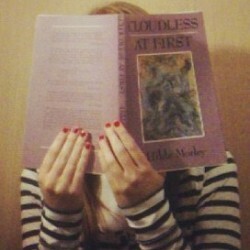 Back then in 2001, finally reading the first book post-film, I didn’t have any quarrels. I sped through it more quickly than I had with any other Potter book, and by the time I finished I was a ball of tears and frustration because who wants to wait on the next installment of your favorite series?! No one, that’s who. Now that the series is officially done, here I am once again—more than ten years later—re-visiting a childhood favorite. 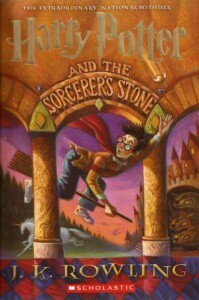 Unlike my younger self, I didn’t read through Harry Potter & the Sorcerer’s Stone with instant love. I had to work through the first several chapters, because not only did I bump into a slow start, it felt less than exciting. I felt... bored! I want to clarify here and now that J.K. Rowling spends time familiarizing her magical world to the reader. Year one in the Harry Potter series is an introduction for most of what will occur in this book as well as the others, and this was my problem. By nature and to a point of fault, I am an impatient person. When I read books, especially series, there is nothing I skim faster than recaps. Although Harry Potter & the Sorcerer’s Stone is the first book, and therefore doesn’t recap anything, I am already familiar with the setting. What I felt most anxious to read pertained to adventure, and danger loiters and waits to show up. By the time readers approach the halfway mark, Harry is merely getting settled into Hogwarts. Well, it’s about time! Now can we please find the creepy Unicorn blood-sucker in the Forbidden Forest? Please? You see, I told you I’m impatient. The “slow start,” as I call it, serves its job well: acquainting readers with these strange wizards and witches, with Harry, and more importantly, Harry’s past. I fell in love with these characters—and loathed a few—all over again, which is a thrilling event of its own. If I had to choose, I might say one of the main reasons I adore the film adaption is because I get to see Harry find his place. The same holds true for the book as well. From the Little Boy Who Lives Under the Cupboard to Wizard-In-Training, I couldn’t ask for a better hero. Although we see his prejudices form in later books, Harry is a kind, loyal friend and brave to a point of detriment. In the end, impatience and all, I must correct my theatric self, because that girl equated wrong. Harry didn’t toss her to the curb; she abandoned him. Back then it felt like the end-all of everything, but just because the story ends doesn’t mean I can’t revisit it. And so that is what I’ll do, again and again and again, no matter how many pages I must read through before I end up in the Forbidden Forest.